Wisconsin Beer Geek: 17th Anniversary Götterdämmerung IPA – Stone Brewing Co.
17th Anniversary Götterdämmerung IPA – Stone Brewing Co.
As I am sure many of you are aware, an IPA is best when fresh, with the hop character fading quickly in some and at a slower rate in others. Stone Brewing is a big proponent of drinking their beers as fresh as possible, most notably with their Enjoy By series, which is great if you have ready access to Stone beers and can pick up a bottle shortly after its release. Up here in Wisconsin that isn't an option, and hasn't been for a few years. Personally, I get my Stone beers from Colorado when family comes out to visit or on a rare trip down to Illinois where Stone is still readily available. 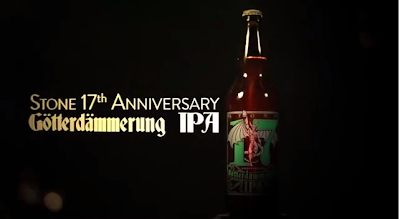 The 17th Anniversary Götterdämmerung IPA is one of the former. Sure, it came out on August 14, 2013 but I didn't have a bottle in hand until mid-December. Heck, I almost didn't grab my notebook to take notes on 17th Anniversary because I was convinced that there wouldn't be much life left to this beer. Then I remembered a speech Mitch Steele gave at the Home Brewers Conference last year, mentioning that many of the newer Stone beers were holding their intended flavor far longer than expected, so I grabbed my book, popped open the beer and prepared to take notes on it so that I could compose a post for all you nice folks who take an interest in my opinions. On to the review! On Beeradvocate, 17th Anniversary has a score of 88, with the bros giving it a 90. At ratebeer, it has a score of 98 overall with a 92 for style. Our latest anniversary beer, starring an all-German cast of malt and hops, is yet one more glorious example of a Stone IPA brewed outside the box. Our brewers have brought their experiments with German hops to fruition, leaving convention behind to create this hefty IPA entirely with pilsner malts. These provide a superbly crisp mouthfeel, while a unique mix of noble and new-school hop varieties adds layers of bright, bitter flavors. Despite the daunting name, this beer isn't designed to bring about the end of the world, but it just might destroy some of your preconceived notions of what an IPA can be. Appearance - Pours deep gold and brilliantly crystal clear with an off-white colored head of foam. Aroma - Focused on hoppy, with herbal and stone fruit hop aromatics. Taste - European hops-herbal, floral, spicy, peppery and resiny, balanced by very clean, intensely bitter, beautiful subtle malt flavors, and just a hint of alcohol. Palate - Crisp and bitter. A very refreshing beer; well suited for the summer! Overall - A very fun beer for us to brew. Through a series of intense dry-hopping trials that we have been running over the past couple of years, we found several newer German hop varieties that we thought were unique and different from the citrusy American hops and fruity New Zealand hops that we have been using so much of this year. An interesting twist on a Double IPA (a German IPA, perhaps? ), brewed with malts and hops traditionally used to brew German lagers and European pilsners. Some of the hops we included in this recipe include Strisselspalt, which has long been one of my favorite noble hops, with a delicate floral character and hints of citrus; Sterling, a US-bred hop with Saaz heritage, and is a hop we haven't used much before, but we just love the intense resiny and spicy pure hop flavor; Herkules, a newer high-alpha German hop variety with intense stone fruit and tropical fruit characteristics; and Hersbrucker, a classic German aroma hop with intense floral and stone fruit flavors. 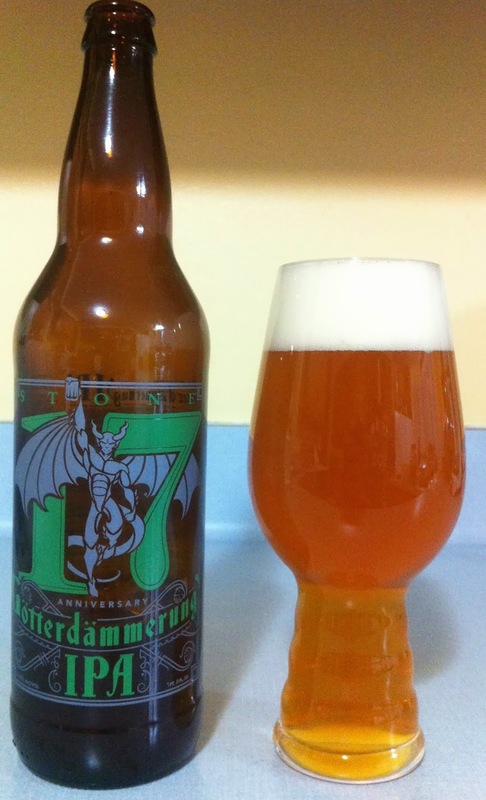 Stone 17th Anniversary Götterdämmerung IPA pours a hazy golden amber with a thick, creamy, white head that holds excellent retention and leaves a moderate amount of lacing behind in the glass. The aroma is surprisingly strong and complex with a strong up front floral and almost peach-like hop aroma backed up with a subtle spiciness and a hint of herbal hops throughout. The soft pilsner malts definitely come forward in the aroma, although there is no doubt that this is a west coast hopped IPA, regardless of the malt and hop combination used. The strong hoppy aromas seem like they will lead to a strong hop bitterness, even though the two aren’t necessarily correspondent. I went into this beer expecting most of the hop flavor to have faded, and maybe it did, but I still got an awesome German hopped West Coast-style IPA out of the 17th Anniversary Götterdämmerung IPA almost SIX months after the release! This is an amazing beer, and if it still had this amazing hop presence this long after the release, I wish I would have tried it fresh! This is definitely a beer that you should pick up if you find it. Don’t worry that it is well past the release date, pick up a bottle and enjoy it. I wish more hoppy beers still had this hop character after 6 months in the bottle! Stone 17th Anniversary Götterdämmerung IPA is an amazing beer! I wholeheartedly support this experimental beer put forward by Stone Brewing Co, it throws the traditional styles to the winds with the same arrogant attitude we have all come to expect from Stone Brewing. I look forward to more experimental Imperial IPAs from Stone in the future, and only wish that they were still available in Wisconsin. That’s all for this week, check back soon for another review! Labels: Imperial IPA, Stone Brewing Co.